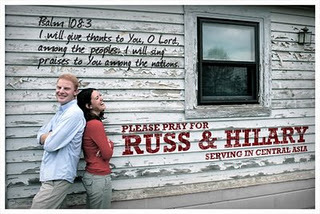 Russ and Hilary are students at the seminary and also members of our church. We met them in our small group and they are a great couple. They're caring, smart, and the biggest UNC fans I've ever met. Soon they'll be going overseas to do missionary work. I admire anyone who leaves behind everything they know to live in a foreign country to tell others about Christ. And I know this particular couple will be blessed for their obedience and faithfulness. I did a little photoshoot with them and Alex used his photoshop skills to make a prayer card for them.